Our passion is to help you do your business better. Our Specialists will be at your side throughout the entire journey. We will help you find the right solution to help you do your business better. As a Nationally Certified Women’s Business Enterprise (WBE) and Woman-Owned Small Business (WOSB), Call One, Inc. can help satisfy your Supplier Diversity objectives. Dedicated account rep and customer service rep who knows your account and can support your needs. Since 1987 we have been helping people do their business better. We offer pre and post Sales support. Call One, Inc. tests the majority of solutions we provide and offer non-biased recommendations. We have strong relationships with our partners. These bonds allow us to provide our customers an added layer of service and support. Call One, Inc. supports how your company does business to include integrating with all major procurement platforms. Call One, Inc. offers an extensive portfolio of hardware, software, and services that span across multiple categories and hundreds of best in class brands. 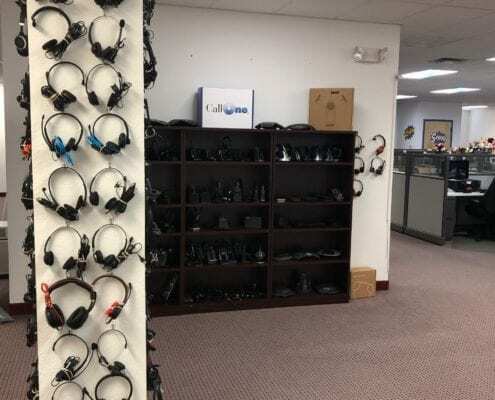 Call One, Inc. is partnered with the leading headset manufacturers to provide the best possible solutions for your contact center. Get the technology solution you need today, and leverage our financing options to maximize your return on investment. Through our strategic partnerships, Call One, Inc. can help your workforce stay productive while on the go with technology that seamlessly integrates with your infrastructure. Call One, Inc. Hospitality Solutions Specialists can help you source Furniture, Fixtures, and Equipment (FF&E) needs across a broad range of best in class brands! Track, configure, and troubleshoot your company’s headsets and audio devices! Which Headset Management Software is right for you? Ready to elevate your company to the next level? for your business, free of pain. © 1987-2019 All Rights Reserved.